The Dual View GCS1744 USB KVMP Switch brings dual head video functionality to IOGEAR's USB KVM switch technology. Now four dual-display computers can be accessed and controlled from a single console that consists of a USB keyboard, USB mouse, and two VGA, SVGA, or Multisync monitors. In addition, the GCS1744 allows the computers to share USB peripherals connected to the USB peripheral ports, such as printers, scanners, portable hard drives, etc. Recognizing the importance of sound, this switch is also audio enabled. A single microphone can provide audio input to each of the computers, and you can enjoy the audio output of each computer on a single set of speakers. Answer: The short answer is yes, this hardware based KVM should work with Windows 7. However, there have been reports that some KVM switches do not pass the console display's EDID and DDC information correctly to all attached systems leading to display issues. This seems to arise mostly when mixing XP and Windows 7 systems. Also remember that like any hardware based KVM, certain functions of multimedia keyboards and multibutton mice may or may not be supported. Question: is audio played simultaneously from all 4 computers or only the selected device? 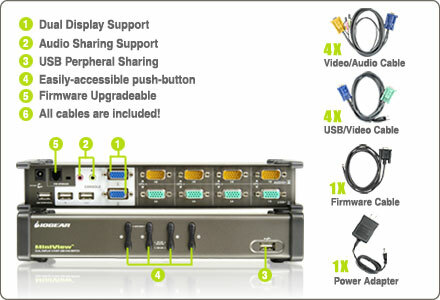 Answer: The IOGEAR GCS1744 dual video KVM provides audio from the selected computer only. The audio source can be selected independently of the KVM, so audio can come from one computer while the KVM focus can be on another source. Question: does IOGear or someone do repair work on the 4-Port Dual Monitor VGA KVMP Switch? I have a blown power supply. Sorry to hear that! They do indeed; The IOGEAR GCS1744 includes a 3 Year manufacturer warranty for any defects and workmanship. You can contact IOGEAR support at support@iogear.com, via telephone at 866-9-IOGEAR (866-946-4327). Question: Is the firmware upgrade cable for the IOgear GCS1744 available for purchase? Answer: Thank you for your inquiry. We reached out to IOGear to inquire about purchasing the upgrade cable. Unfortunately, they do not sell the upgrade cable separately. 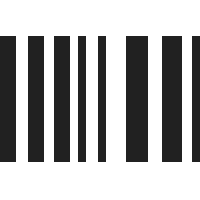 Additionally, they responded that earlier serial numbers for this model are not firmware upgrade-able. However, they added that if the KVM was capable of being upgraded, they would send out a cable directly. Please reach out to the IOGear support team directly and they should be able to assist you further. When you contact them, please be sure to include the serial number of the switch to determine if the unit's firmware is able to be updated.